Getahound is a new dogsharing service that empowers people to instantly pet, walk, and boop the noses of great pups in the area. On the Getahound app, the best dogs in your neighborhood can be rented by the hour with pet insurance and 24/7 obedience training included. With Getahound, dog lovers can skip the lines of drool and piles of pet hair associated with owning and maintaining a canine. Powered by Connectahound™, our patented connected dog technology, Getahound provides convenient on-demand dogsharing without the need to exchange leashes with an owner, carry a pet shop membership card, or invest in dog treats. 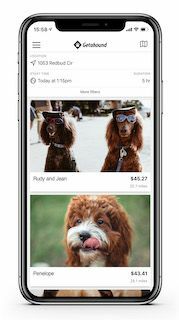 Now dog owners can share everything from a Affenpinscher to a Yorkipoo and earn thousands in extra income each year, offsetting the high costs of kibble and veterinary visits while also making a positive impact on belly rubs and waggy tails. Headquartered in San Francisco, Getahound has a growing number of dogs available throughout major metropolitan areas across the United States. Existing investors in Getahound include ScruffBank Group, Mastiff Ventures, Beagle Energy Ventures, Kennels Plus, Puppers Peak Partners, Ruff Group, and DOGGO Capital. Sign up for the Getahound app to find dogs in your area today! Introducing Getahound, a ruffolutionary new dogsharing service. Roll over to the link in our bio to start #dogsharing.